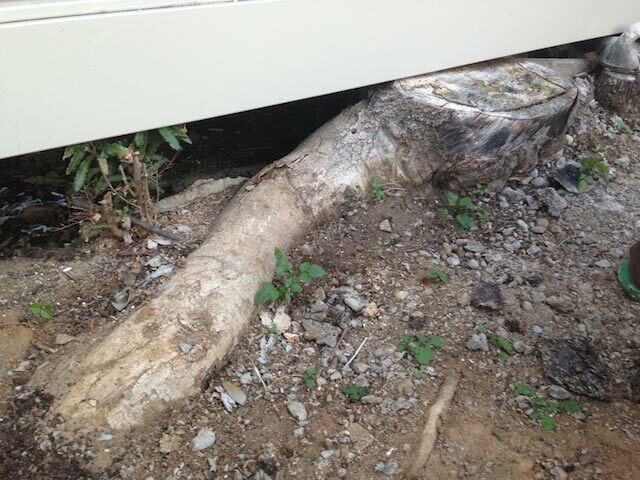 We received a call from a builder where he had come up against a difficult situation involving a tree stump. 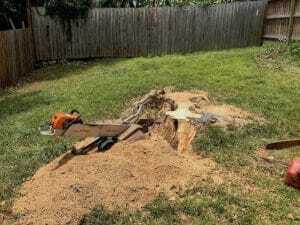 A lack of planning created a more difficult and more expensive stump grinding job. We had to set up our aluminium ramps to straddle the trench. This added more risk as the stump grinding machine could have fallen into the trench. As the wall was quite soft there was also a risk of the trench collapsing. In short, when there are tree stumps involved ring us first. This will save you lots of time, money and stress. 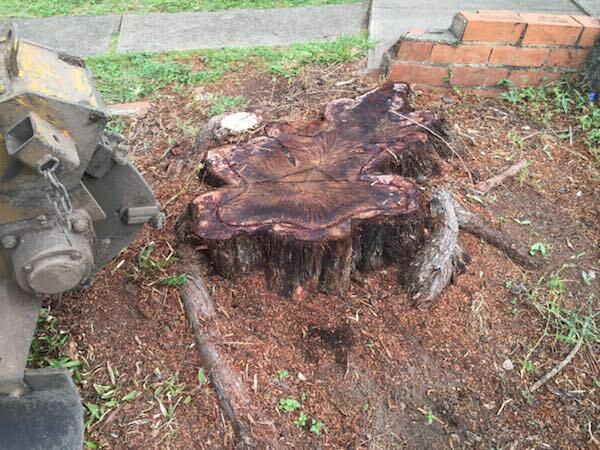 Recently we went to a job where a customer had been given a price by another stump grinding company over the phone. When we inspected the job our price was more than double. It turned out the other company turned up to do the job but all of a sudden the machine broke down before he could start. We carry three different sized stump grinders for a reason. 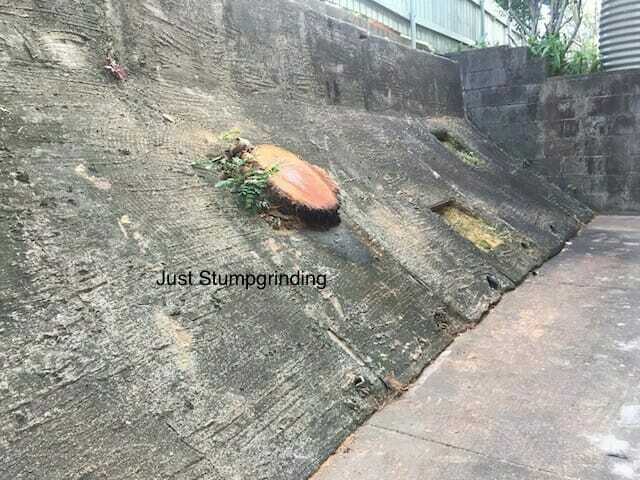 It makes us more efficient and allows us to grind any stump requested by us. We get to the job site and realise access is very limited and only possible with our small portable hand held stump grinder. As you can imagine the customer is assuming the price would be similar if not the same amount originally quoted by the other company. After explaining the situation and our three different stump grinders to the customer he completely understood why our price is double. Our customer thought it was fair, and reasonable and wanted us to go ahead with the job. 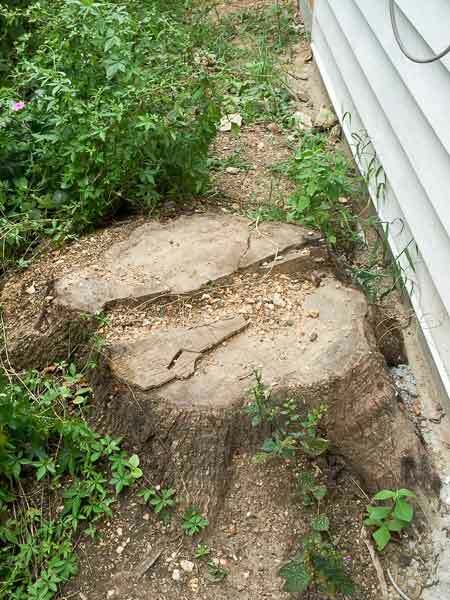 Access has more of a significant impact on pricing than the size of the stump. 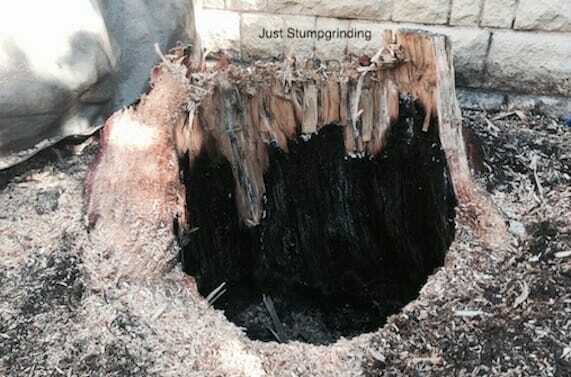 We received a call from a client who had attempted to remove their tree stump by burning it. It had been slow burning for a few weeks. Annoying the neighbours with smoke, and annoying his partner with smokey washing on the line. 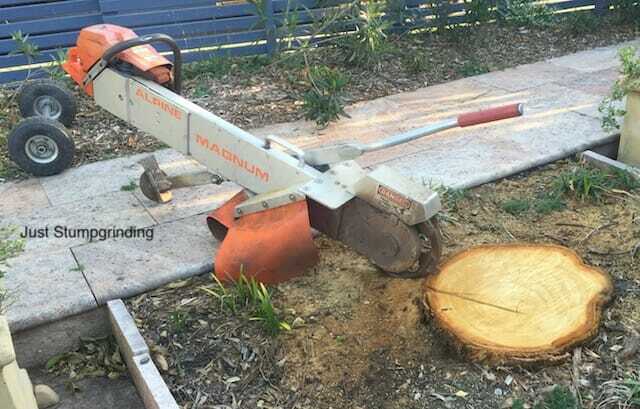 It was in a restricted access situation so we had to use our portable tree stump grinder. When quoting stumps from photos we need perspective. 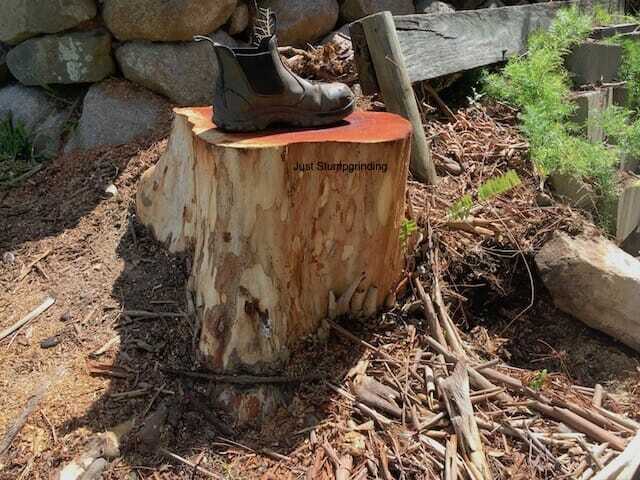 Place an item on the stump or beside the stump so we can get an indication of dimension. Something simple like a shoe, garden rake or brick. Also what affects tree stump grinding pricing the most is access. The larger the stump grinding machine we can get to the stump the cheaper the stump grinding price will be. ie measure gate widths and pathways. The average gate size in Brisbane is approximately 900mm. Also look for air conditioning and hot water services blocking access. Safety is an important priority for us when stump grinding. We do carry around protective barriers to all our jobs. 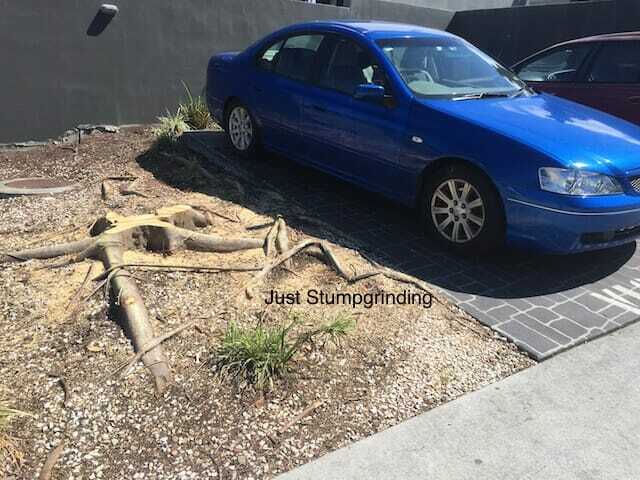 However, this car is parked right next to the stump. So we would need to ensure it is moved prior to completing the grinding work. 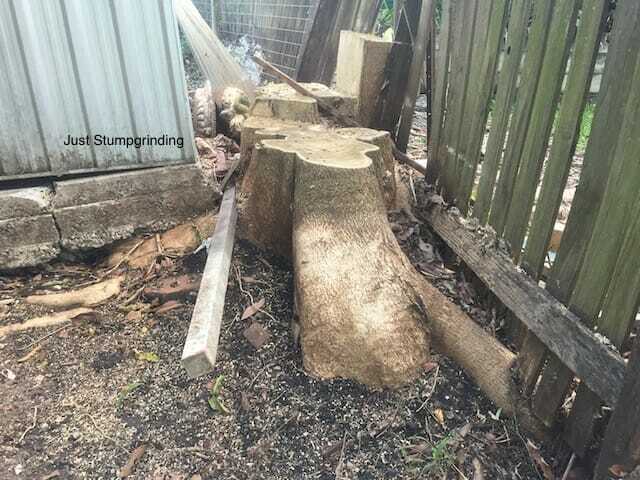 There are also multiple stones around the stump, which the grinder can flick up. Before giving us a call please ensure all stones and vehicles are removed from the immediate area. Our portable stump grinder enables us to get to those difficult to reach areas. 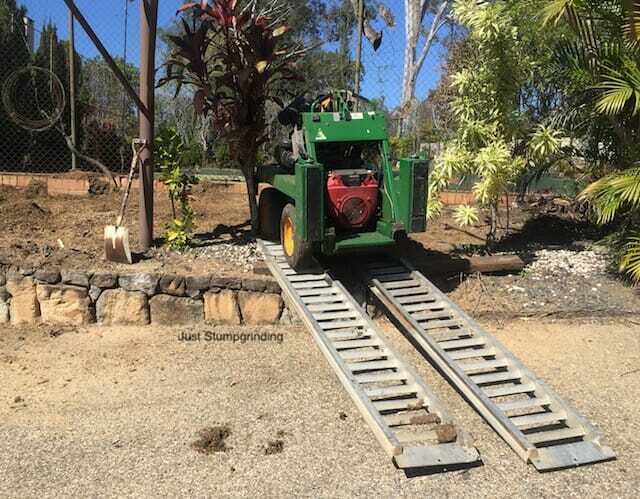 Due to the weight of this machine, we are able to use in delicate areas. This ensures no damage is carried out to any surrounding tiles or surface areas. This small machine allows the operator more control and accuracy to ensure we are completing the grind efficiently and accurately. 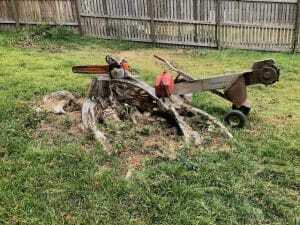 Most of the time when you have a problem with a tree root ball you have had a large tree fall over. In most cases it is the result of a storm with high winds. The trees branches and trunk are pretty straight forward to deal with utilising chainsaws and wood chippers. When it comes to whats left i.e. the rootball that is another story. 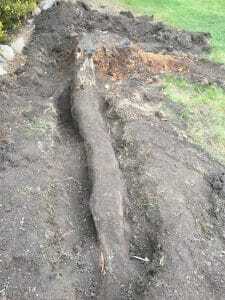 Tree root balls can be a challenge to remove. They can be quite heavy and also in difficult positions for crane trucks to pick up and take away. The cost of the crane truck, the time to drive away to the dump and then the cost of dumping all adds up. Stump grinding the rootball is in most cases the most efficient way to deal with them. When you take into account all aspects of removal our experience is that it is also the most cost effective option. Our larger stump grinder is very versatile in its ability to lift the grinding head. This enables us to grind the largest rootballs. 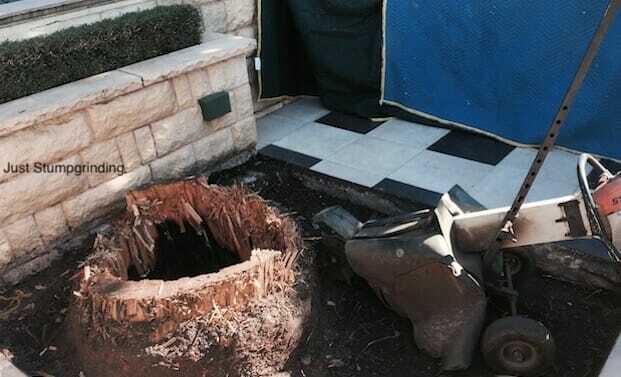 It doesn’t matter how big the tree root ball is we can take care of the problem. 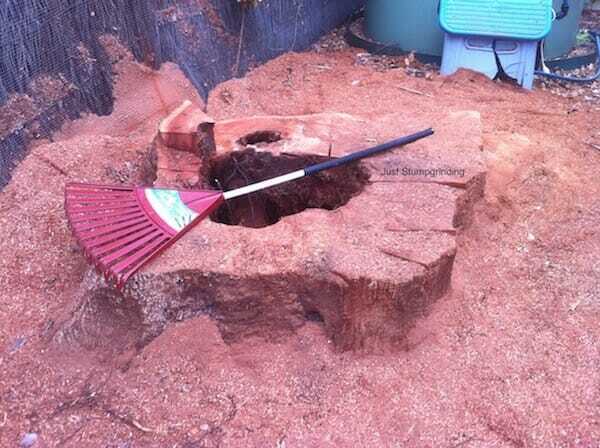 We have had to stump grind rootballs 2 metres tall which would be near impossible for the average stump grinder. 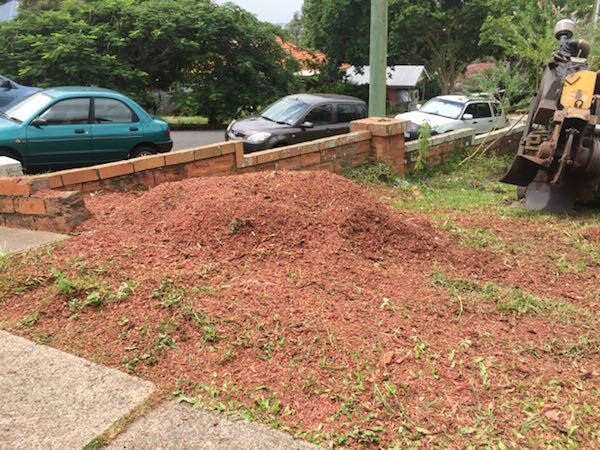 We turned this tree rootball in Ashgrove into usable mulch with not too much difficulty. The small little clouds in the video were the dirt clump which surrounded the tree roots. Most of the left over mulch and dirt went into filling up the hole which was left when the tree fell over. It is more than likely, that the combination of tree root mulch mixed with soil in that particular area will end up being the most fertile because of the extra organic material in the soil. You may have to compact the area down a bit and allow for settling. Its amazing how many calls we get for jobs like this. Tree stump left under someones house. Do you think the builder was negligent, blind or just plan didn’t care? Customer wanted it gone. Was a bit of a challenge, grinding down deep enough to be able to get the tree stump out from under the side of the building. It went from what would have been a simple minimum grinding job ($100 plus GST) to one with much greater cost because if difficulty and risk of damage to the side of the building. If you ever see your builder taking short cuts, don’t let them, say something and don’t except the poor workmanship. The most obvious problem lies in the potential termite or white ant nest problem. 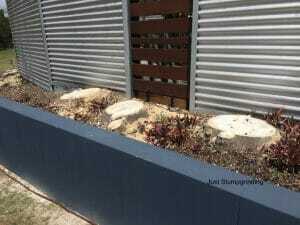 The tree stump if nothing else will require constant chemical treatment to make sure termites don’t show up under the building. On the same subject. This one was nearly as bad. A very large tree stump beside a building slab. 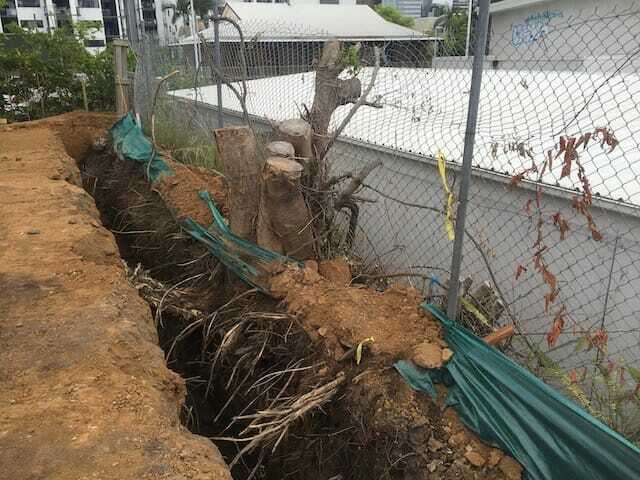 Tree roots would have been growing under the concrete slab. We could grind this out to a satisfactory depth and have all the wood mulch moved away from the building. It just would have been a lot cheaper and easier to do the job properly first. Customers sometimes ask what will be left over after tree stump grinding. Check out the before and after pictures. The tree stumps compacted fibres are cut/torn apart with the stump grinders tungsten carbide cutting teeth. Consequently the stump grinding mulch created is aerated and fluffed up which greatly expands the volume of material. If the mulch is left to nature, usually within a few weeks the volume is reduced by about a third. The stump grinding mulch begins to decompose which is the natural process of returning the wooden fibre back to the earth. 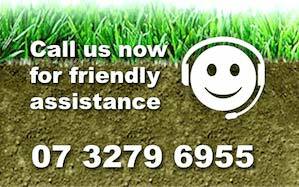 Most of our customers like to spread the mulch over their gardens which greatly assists the soil to retain moisture which helps plants grow. 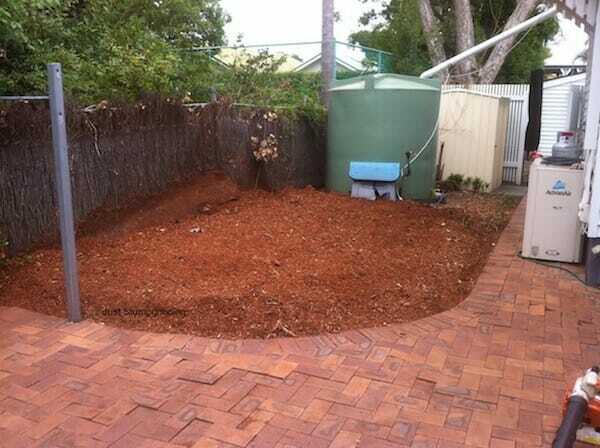 Make sure however you don’t put the mulch against your house slab or footings. You do not want a termite or white ant highway to your home.